The word hypocrite sounds irritating especially when used to describe a seemingly gentle and honourable person or persons. So we really need to know the dictionary description of the word hypocrite. The definition provided by Dictioary.com describes a hypocrite as ....a person who pretends to have virtues, moral or religious beliefs, principles, etc., that he or she does not actually possess, especially a person whose actions belie stated beliefs. So How does Britain fit into this description? Britain is purportedly a Christian Nation. But in the known history of the world, Britain has never taken sides with any Christian nation or supported the emergence of any Christian nation. Is this not hypocrisy? The British colonized Nigeria and amalgamated three different nations, the Biafrans, the Oduduwas and the Arewas into one country. Of these three nations, only the Biafrans accepted the British Christian religion. The Biafrans accepted the Christian religion and even changed our names to reflect the English names contrary to the other two nations of Oduduwa and Arewa. But when Biafra sort for her self-determination, Britain sided and aligned with the Muslim Arewa and Oduduwa and slaughtered over 3.5 million Biafrans. Is there a greater exhibition of hypocrisy than this? But we are not done yet. A person who feigns some desirable or publicly approved attitude, one whose private life, opinions, or statements belie his or her public statements is a hypocrite. Britain is all this. Britain is a signatory to the United Nations charter of the right of the indigenous people to self-determination in recognition of which the United Kingdom gave the Scotish people a referendum in 2015. But when Biafrans asked for that same right, Britain sponsored Nigeria to slaughter Biafrans again from 2015 till date. Britain moved a motion on the floor of the British Parliament against any adjustment to the territorial boundaries of Nigeria but did not consider what will happen to the territorial integrity of Britain when they gave Scotland a chance to leave by a referendum. But when it comes to Biafrans leaving Nigeria, Britain, the mother of all hypocrite would not allow the territorial boundaries of Nigeria to be tampered with. Then the question is, was Nigeria one country before the amalgamation of 1914? When Nigeria ceded the Bakassi peninsular part of Nigeria to the Muslim Cameroons under General Olusegun Obasanjo, the then Nigerian President, Britain did not see anything wrong in the adjustment to the territorial boundaries of Nigeria, but when the Christian Biafrans asked for their freedom from Nigeria, British-supplied weapons were used to murder them on the prayer ground in a football pitch, and in churches. Some communities in Ogun State in Nigeria was recently taken over by the Benin Republic in recognition of the expiration of Nigeria. Both Britain and Nigeria did not even raise an eyebrow. And now that their stooge Muhammadu Buhari, the half dead president of Nigeria is pursuing the campaign of Islamization of the Christian Biafrans, the British and their evil mouth piece, the BCC will never see the atrocities. How hypocritical could one nation that propagates democracy and the rule of law be? The British people voted in a referendum to stay or exit the European Union. In that vote, those in favour of British exit had it. No one opposed their choice to leave the EU. It will amount to a display of arrogant hypocrisy if Britain will continue to sponsor the extra-judicial killing and slaughter of Biafrans for just seeking to exercise their right to self-determination. 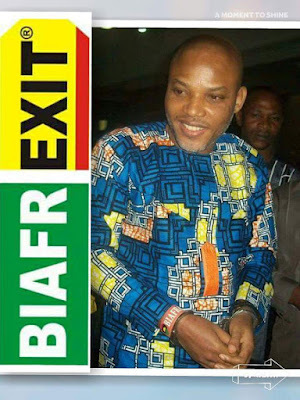 Britain must allow Biafrans to go as the European Union allowed them to go by a referendum. Anything short of this will amount to a white smear on the beauty of democracy and freedom. Britain left the EU through the Brexit referendum. Biafrans will leave Nigeria through a Biafrexit referendum. David Cameron gave his people the chance to exercise their will and opinion whether to remain in the EU or not through Brexit. If he David Cameron is not a shameless hypocrite, he must encourage the tyrant ruler of Nigeria Mohammadu Buhari to give Biafrans the right to exercise their will and opinion whether to continue remaining in Nigeria or not through Biafrexit.